Gore-Tex Gazelles on the way for Moscow and St. Petersburg. Adidas brings the Gazelle to Russia with this new set consisting of two shoes connected to separate cities in the nation. There's a white/red Moscow pair and a black/blue St. Petersburg one, each calling out the connected city with gold lettering on the side. Both have Gore-Tex materials suited for the cold climates of the cities in question and Cyrillic script on the left shoes to further the European flavor. Fittingly, the red Moscow pair released early at the opening of the new adidas Originals store in the Russian capital. 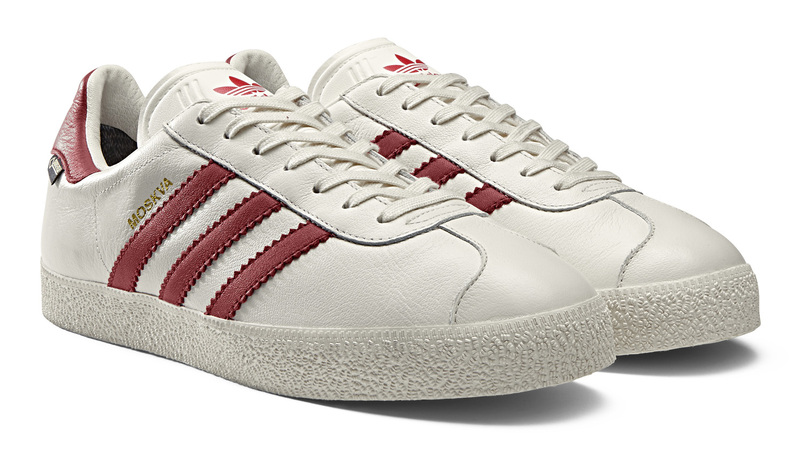 This duo of adidas Gazelle styles releases on Oct. 7 for $110 each.